Last I checked, this anime was available on DVD at The Right Stuf and Amazon, and on VHS at Amazon. Deep in the Milky Way is a planet known as Zi, with two moons and an environment much like Earth's. 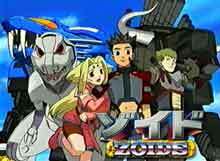 Once long ago, an ancient civilization created bio-mechanical mechs they called Zoids. Their race has since disappeared, but the Zoids they left behind still exist, and they have become the focus of the conflict. The story of Zoids Chaotic Century is split into two parts. The first part take place during a titanic war between the two greatest nations on Zi: the Guylos Empire and the Helic Republic. Into this chaos enters three different yet connected lives: Van Flyheight, a young Republican who stumbles upon some ancient ruins; Zeke, an Organoid in the ruins who has the capacity to revive and maximize the potential of Zoids; and Fiona, an ancient Zoidian awakened from her sleep and who now accompanies Van on his journey into destiny. With the help of the kooky Dr. D, the mercenary Irvine, and the independent Moonbay among others, Van inadvertently finds himself on a course to stop the war before it takes a disastrous turn. The second part takes place four years after the peaceful resolution of the war. In an effort to help prevent future wars, a Guardian Force is jointly established by the Empire and the Republic. Its mission is to seek out volatile groups and contain them before they can cause more chaos. Van and Zeke are among the Guardian Force's key members, and those they met in their previous adventure come back in this new chapter. It is during this period that more of the Zoidian secret is revealed as the true battle for the of planet Zi begins.